1. The first class of actions are those known or presumed to result in significant environmental impacts, for which an EIS would be required. the agency has formally identified the actions to the public through a list in the Federal Register. The agency may exclude proposed actions in this category from the requirement to prepare either an EIS or an EA; actions of this type are referred to as "categorical exclusions." Some agencies abbreviate this as "Cat-X" or "CX." 3. The third class of actions are those expected to result in impacts that are not significant, or those where the degree of significance cannot be accurately predicted, for which an EA would be the appropriate initial NEPA review. Figure 4.1 depicts the process used to determine which path of analysis to take. Although some preparers think of EISs as "big NEPA," EAs as "medium NEPA," and categorical exclusions as "little NEPA," this mindset oversimplifies the situation. It is possible that the degree of significance of impacts from a proposal analyzed under an EIS, one analyzed under an EA, and one covered by a categorical exclusion would be very similar. The point of a NEPA review is not to explain away or minimize the impacts that might occur, but rather to accurately capture the significance of the environmental factors that would bear upon an agency decision. As stated in the CEQ regulations (40 CFR 1500.1(c)), the purpose of NEPA is not to generate paperwork but to lead to "excellent action." An agency should embark upon an EIS as the initial level of NEPA review for those "major actions" that would "significantly affect" the environment, as those terms are defined in the CEQ regulations. An agency might have identified a proposal as falling within a class of actions that normally require an EIS. Or, using the gift of common sense, an agency may discern without lengthy analysis or a preliminary EA that a proposal would result in significant environmental impacts and proceed with an EIS, such as when considering plans for very large, very expensive facilities, proposals involving transportation or use of large quantities of highly toxic materials, or actions that would obviously adversely affect large areas of critical habitat for endangered species or infringe upon major archaeological sites. An agency may decide to prepare an EIS as the initial level of NEPA review for one-of-a-kind actions where impacts are unknown or highly uncertain without going through an initial EA process. Lastly, an agency may decide to prepare an EIS on any action "to further the purposes of NEPA," even if environmental impacts would not be significant. The EIS process includes the NOI, the draft EIS (DEIS), the final EIS (FEIS), and the ROD. These documents should be formatted in accordance with the CEQ regulations and the requirements of the proponent agency. not be a significant impact, it would generally be just as quick to complete the EIS process and prepare an ROD as to abandon the EIS process and prepare a FONSI). This course of action (abandoning the EIS and preparing a FONSI) would lead to a greater risk of litigation, and higher probability of litigation success against the agency, than the option of completing the EIS process. If an action is listed by the proponent agency as one that normally would require an EIS, but in a specific case the agency has reason to believe that impact might not be significant, the agency may prepare an EA as an initial level of NEPA review. Depending on the agency, this approach may require several levels of agency approval before being initiated; check with agency requirements before seriously considering this path. If it is clear that an EIS would not be the initial level of NEPA review, the NEPA preparer should then look to see if a proposed action could be categorically excluded from preparation of either an EIS or an EA. A categorical exclusion is not always reserved for actions with very minor impacts. While the impacts of a categorically excluded action may be minimal, in other situations they may be essentially the same as the impacts of an action addressed by an EA and FONSI. 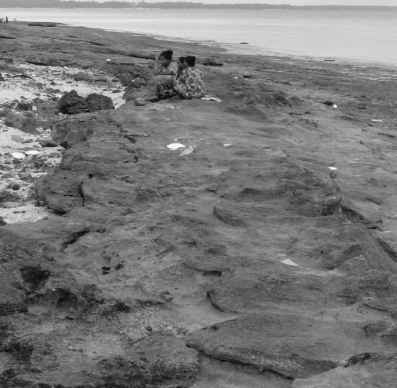 Regardless of how minor the environmental impact may be, an action must appear on the agency's list of classes of actions that can be categorically excluded in order to pursue this approach. Categorical exclusions are specific to the issuing agency: An action that is categorically excluded by one federal agency may not be on the list of exclusions of another agency. If the agency knows that in a specific extraordinary instance the impacts from a listed action might be significant, such as if the action were to take place in a designated wetland, the CEQ regulations provide that the categorical exclusion not be applied and that another type of NEPA review (EA or EIS) be performed instead. Requirements for documenting categorical exclusions vary from agency to agency; many agencies do not require any documentation for all or some types of categorical exclusions, and others use some type of checklist or short memorandum. Check with the agency procedures for documentation and notification requirements. As a word of warning, an agency may have reason to believe that a proposed action falls within its listing of categorical exclusions, and fail to perceive that other parties, including regulatory agencies, do not share that opinion. Great care should be taken to try not to stretch the listed definitions, or to "force fit" an action into the desired categorical exclusion, if a substantial segment of the public does not agree. 96 Chapter Four actions where either it is thought that impacts would not be significant or it is difficult to determine whether impacts would be significant or not. In these cases, an EAis prepared. The EA analysis is very similar to the EIS analysis, but generally there are fewer alternatives to the proposed action, the alternatives do not have to be analyzed to the same degree (as is the case with an EIS), and the analysis of the proposed action and alternatives needs only to be sufficiently detailed to demonstrate that no significant impacts would occur (leading to a FONSI) or to demonstrate that they would occur (leading to an EIS). In some cases the analysis is inconclusive and it cannot be determined if impacts would be significant or not. In these cases an EIS would be prepared instead of a FONSI. In some cases, the EA analysis might demonstrate that while the proposed action would not be expected to have significant impacts, a reasonable alternative course of action would be expected to have significant impacts. In this event, an EIS should be prepared so that the decision maker will have full disclosure of the significance of the options available. The EA review process includes preparing an EA and, if warranted, a FONSI. Most agencies prepare an EA using a format modeled on that required for an EIS. However, there are other approaches and other formats in use among federal agencies. Some agencies have developed a checklist approach used for simple EAs. An alternative format for a simple EA is described later in this chapter. While the content of an EAis similar to that of an EIS, the process is simpler. 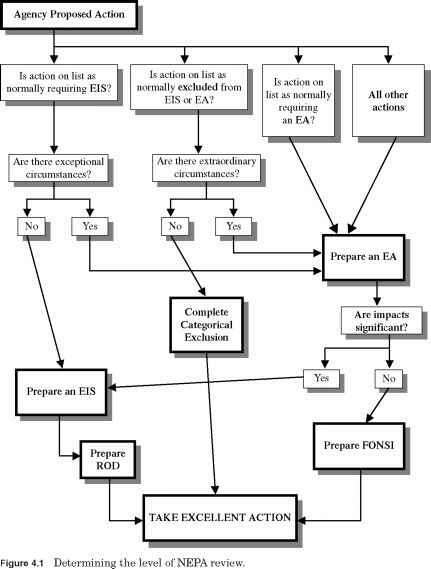 An agency is not obligated to provide notification to the public or other agencies that an EA is being prepared, does not have to prepare a draft EA for circulation and comment, and does not have to consider public input in the preparation of the document, although many agencies take some or all of these steps. The agency does not have to disclose in any detail its final decision or its decision factors, although it does have to disclose its FONSI and the EA upon which it is based. To facilitate agency action and public access to information, some agencies prepare a decision record along with the FONSI and make it available, similar to the ROD following an EIS. action. These types of challenges have caused lengthy and expensive project delays.